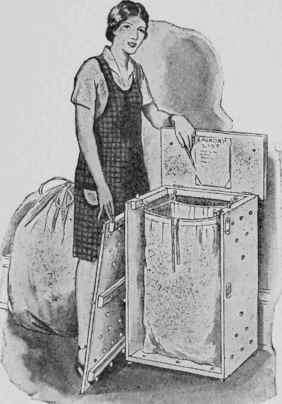 The laundry case illustrated in Figs. 27 and 28, aside from being an attractive receptacle for soiled linen, has the added advantage of being so constructed that the full, heavy laundry bag can be removed easily by taking out the front of the holder. No heavy lifting is necessary. Fig. 27. - By removing the front of this laundry case, the tied bag can be easily taken out and an empty one hung in place. For the family that is now stowing its soiled linen and clothing wherever it will best be out of sight, this case would be a much appreciated addition to the house furnishings. The sides may be made of ½ inboards glued to give the required sizes; but to avoid danger of warping and splitting and to insure strength, we will assume that ½-in. plywood will be used. Cut the back and the front 18¾ in. wide, the two ends 11 in. wide, and all 29½. in. long. These widths will allow the pieces to be cut from plywood 30 in. wide, which is a stock size. Make two cleats A, ¾ by 1¼ by 9½ in. and three cleats, B, B-l, and B-2, ¾ by 1½ by 17¾ in. and bevel them ¼ in. as shown. Bore %-in. holes for dowels in cleat B-2 and fasten all cleats with glue and brads. Bore 1-in. ventilating holes as indicated in all sides. Make the bottom ¾ by 11 by 17¾ in. and the top ¾ by 13¼ by 20¼ in. Fit and glue pointed 3/8-in. dowels in B-2 and bore holes in the front of the bottom to receive them. Fig. 28. 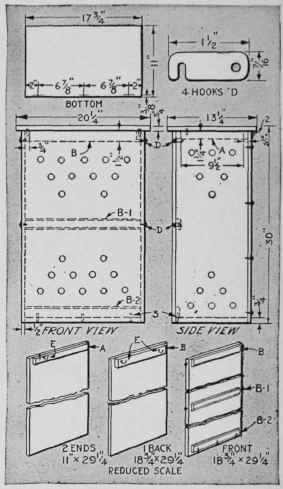 - Assembly drawing of the laundry case and details of the construction of front, back, and sides. Assemble with brads through the back and ends into the bottom and with screws through the back, for brads alone will not hold so well. Fit the front in place. Make or buy four flat brass hooks D and fit in place with ¾-in. No. 10 roundhead screws, filing their points off where they come through the ends. Hang the top with 2 by 1¼ in. butts (hinges) as at 2 in the side view. Fit and glue a 3/8-in. pointed dowel in cleat A of each end and bore a corresponding hole nearly through the top to hold the top front corner of the ends in place when the front is down. Fig. 29. 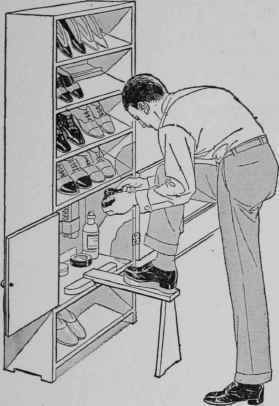 - A large shoe cabinet. The bracket that holds the foot piece can be folded up and hidden behind the two doors. Prepare two cloth laundry bags that will fit the case loosely, making them about 1 yd. high to allow for a draw string in the top edge. When a filled bag is sent away, an empty one may be put in its place. To remove the bag, tie the draw string, close the cover, raise hooks D, draw the top of the front forward, lift the dowels in B-2 out of their holes, and pull the bag out through the front. Replace the front, lift the cover, and put in the empty bag. Hooks placed at E and corresponding rings or loops on the outside of the bag will be convenient in keeping the bag open. Pieces of tape or wide rubber bands fastened to the inside of the cover to hold laundry lists will constantly remind each one to record daily deposits. The case may be painted or lacquered in attractive colors. Four casters or polished steel glides may be placed in the bottom to move the case about.